Bristol is being hailed as one of Europe’s leading travel hot spots after a top award as the ‘Rising Star’ of the international tourism industry. The city beat shortlisted Valencia in Spain and Tbilisi in Georgia at the prestigious National Geographic Traveller Reader Awards in a category that recognises the destination that is ‘making a name for themselves’ worldwide. Bristol emerged victorious at a ceremony at London’s May Fair Hotel earlier this week with the judges saying: “The Mild West’s hip hub city has long been bubbling under as a must-visit mini-metropolis, but it’s finally surfaced to get the broad attention it deserves”. The National Geographic awards, staged in association with travel firm Flight Centre, are regarded as the definitive word on the best places, experiences, hotels, operators, travel personalities, podcasts and more. Destination Bristol head of tourism Kathryn Davis, who collected the award on the night, said: “This is some achievement for the whole of the Bristol region, not just to be shortlisted alongside Tbilisi and Valencia but to go on and win the ‘Rising Star’ destination is just incredible! The announcement was made just days after Kathryn’s own ‘outstanding contribution to tourism award’ at the Bristol, Bath and Somerset Tourism Awards – in which Bristol’s Tourist Information Centre also won Gold in the Visitor Information Centre category. The accolades come as recently announced inbound tourism figures for the city revealed it enjoyed a record-breaking year. The annual International Passenger Survey shows Bristol recorded a 6% growth in international tourism, attracting an estimated 602,000 overseas visitors, breaking the 600,000 visits benchmark for the first time and capping a total increase of 60% since 2010. This makes Bristol the seventh most popular destination in Britain for overseas staying visitors – a move up from eighth last year. The top 10 countries for visitors to Bristol are France, Spain, Germany, Poland, Republic of Ireland, USA, Italy, Netherlands, Switzerland and Australia. Bristol’s tourism economy is estimated to be worth more than £1.3bn and supports almost 29,000 jobs. 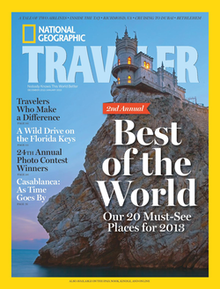 Readers of National Geographic Traveller voted in 17 categories for the 2018 awards – the fourth year the magazine has staged them. Other category winners included One for the Kids (Walt Disney, Florida), Right Track/Rail (Eurostar, London to Amsterdam) and Screen and Sound (Blue Planet II – made in Bristol by the BBC’s Natural History unit).